Lickable – straight from the tub! Cooling and soothing – a healthy and refreshing treat after walks or training. 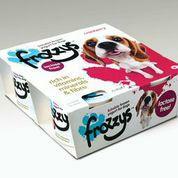 Lactose free – gentle on a dogs sensitive digestive system. Low-calorie – assisting with healthy weight management. A tasty teething aid – can reduce swollen and inflamed gums, whilst offering something tasty for puppy to chew on. Highly palatable – can be defrosted and poured over kibble to entice fussy eaters. Perfect treat on a hot summerday.